Room : Chambre spacieuse, propre, agréable. Calme. Les draps sont propres et sentent le frais. Accès pas évident à trouver surtout le soir. The Château du Corvier, set in 60 acres of grounds with centuries-old trees, is a magical place where time seems to have stood still. Heated outdoor swimming pool, hamam and jacuzzi. 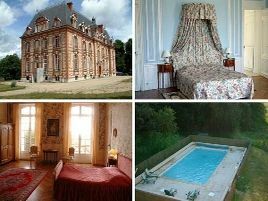 The rooms are decorated in keeping with the house with splendid Louis 15th and 16th furniture. Guest meals with reservation. Friendly welcome. An ideal situation for visiting the Loire châteaux, sampling the local wines and gastronomy or even participating in a hunt. .
- Hammam et spa sur place. - Golf des Aisses à la Ferté St-Aubin, 10 km. 1 suite and 4 rooms with bath and WC. 110 euros (1 pers. ), 130 euros (2 pers. ), 150 euros (3 pers. ), 160 euros (4 pers.). Extra bed 20 euros. Baby equipment, babysitting. For teenagers: swimming pool, mountain biking. Family room. Plenty of space. The closest station is La Ferté-Saint-Aubin, located at 13 km.